Video clip synopsis – Veteran ABC journalist, Sean Dorney, looks back on his time in Papua New Guinea covering the Bougainville crisis. Broadband MP4 conflict_bb.mp4 (22.9MB), suitable for iPods and computer downloads. Journalist’s Diary of a Conflict is an excerpt from the two-part documentary Paradise Imperfect made in 2000. 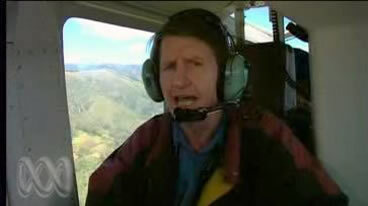 In 2000 the ABC’s Pacific Correspondent Sean Dorney travelled to the war zones of Bougainville to look at the impact of the 9-year secessionist conflict and the fragile peace process. Discovery of copper deposits in Bougainville in the 1960s led to the development by Conzinc Riotinto Australia (CRA) of the Panguna open cut mine — at that time the largest in the world. Following negotiations led by New Zealand, a truce monitoring force came to Bougainville in 1997 under the auspices of the United Nations. This was the beginning of a long and complex process of reconciliation. In 2001 a ceasefire agreement committed the Island to a referendum on full independence from Papua New Guinea in 10 to 15 years. In 2005 a provincial government was elected, led by Joseph Kabui. The new Bougainville administration will run the island with much greater autonomy, while the central government of Papua New Guinea will control defence and foreign affairs. Though up to 15,000 people died as a result of the conflict in Bougainville, the Australian population remained largely ignorant of the civil war. In a decade of conflict Australia was unable to intervene successfully. The Australian government policy committed to Papua New Guinea as a unified government — Australia could not deal with Bougainville as a separate entity. The loan of helicopters by Australia to the Papua New Guinea Defence Force, helicopters which eventually had machine guns mounted to them, further ensured that Australians were not trusted on Bougainville. As ABC’s correspondent to Papua New Guinea, Sean Dorney was one of the few journalists present in Bougainville when the crisis over the province’s copper mine flared in 1988. He charted the crisis from its beginnings as a landowner dispute to its escalation into a brutal civil war. In this video clip Sean Dorney speaks of the logistical difficulties in reporting before satellites and of his efforts to give ‘context’ to his short reports. How important are ‘front-line journalists’ in informing us about conflicts in the world and their context? At times Dorney ‘had the story to himself’. Comment on the dangers of this from a historian’s perspective. Dorney mentions various ‘players’ in the conflict. Draw up a list of all of the ‘interested parties’ you can recall and briefly note their role in the conflict.